In the epic trilogy, comprised of the books The Golden Compass, The Subtle Knife and The Amber Spyglass, Pullman unlocks the door to a parallel world where strange creatures live side by side with humans, and humans share souls with animals. The books center on precocious young protagonists whose adventures lead them into battle against the ultimate evil with the fate of the universe in their hands. Pullman is the first children’s author to ever win the UK’s prestigious Whitbread Book of the Year prize. Watch the preview in HD over at Yahoo! here. Captures from the preview were added to the gallery as well as a new promo shot. Thanks to Aurore, we know that Eva is nominated for the NRJ Ciné Awards 2007 as Best Newcomer for Casino Royale. She’s up against other Frenchies, including the talented Mélanie Laurent who won the Best Female Newcomer award at this year’s Césars (the French version of the Oscars). The competition is tough but you can help Ms Green by voting for her. 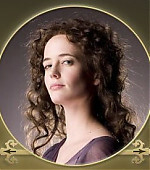 I’ve added 5 new “Golden Compass” posters to the gallery and two of them features Eva Green as Serafina Pekkala. There are also individual posters for her co-stars: Nicole Kidman, Daniel Craig and Dakota Blue Richards. Happy Birthday / Joyeux Anniversaire!!! May all your dreams and wishes come true year after year! British designer John Galliano marked his 10th year at the creative helm of iconic fashion house Dior with an extravagant fall/winter show in Versailles Palace inspired by Impressionist and Modern painters. The fashion house, whose controversial creations helped build its fame, also celebrated its 60th anniversary with opulence that evoked the reign of “Sun King” Louis XIV, the 17th century monarch who transformed Versailles into a royal palace. The fashion brand, cherished by the rich and famous, used the occasion to reflect on its evolution from Christian Dior’s 1947 “New Look” to Galliano’s theatrical dresses. Models, who included Dior face Gisele Bündchen and Linda Evangelista, strutted in dresses inspired by painters ranging from Cocteau and Picasso to Renoir, Degas and Toulouse-Lautrec. Luxury goods maker LVMH, the owner of Dior, threw a ball complete with classical music quartet attended by actresses Monica Bellucci, Charlize Theron, Kate Hudson, Ellen Pompeo, Zhang Ziyi and Eva Green among others. Also present were film makers Pedro Almodovar and Sofia Coppola and singer and actress Marianne Faithful. The fragrance is described as an amber-y, rosy, and woody fragrance, which was created by perfumers Jacques Cavallier and Olivier Cresp of Firmenich in collaboration with François Demachy of LVMH. The perfume starts out with fruity top notes of mandarine and bergamot, glides into a rose heart and leaves an amber-y and woody wake composed of patchouli, amber, and Bourbon vanilla. The bottle, designed to be reminiscent of the sweep of Cinderella’s dress as she flees from the ball in the midnight haze, is a mix of celadon, cobalt and ultramarine blues, and its shape follows the design of Dior’s Poison bottles. The outer carton is said to contribute to this celebration of nocturnal charms and is also inspired by the magic of the tale’s clock striking midnight. The scent will retail between 22 Euros and 101 Euros. Midnight Poison is slated to be out on September 3rd 2007. Eva will not be doing “Mr Nobody” after all. Jared Leto and Sarah Polley will definitely be in it but the actress who’ll perform the role that was supposed to be Eva’s wasn’t announced yet. The filming of “Franklyn” will probably start filming around August. Ewan McGregor is currently on a motorbike ride and Paul Bettany is filming “There For Me” in London. EDIT: She didn’t take the role because of scheduling conflicts. After a month of hiatus, the EvaGreenWeb.com & EvaGreenOrg.ru Forum is back! As usual, please contact the moderator gave if you have any questions concerning your account. I’m not online as often as he is. All the previous CCB covers and articles can be found in the gallery. Please don’t forget to credit the talented artists if you decide to use their creations. Off-topic: My wonderful host, Gertie, recently opened a fansite dedicated to British actress Michelle Ryan, best known for EastEnders and who will be starring as the new Bionic Woman this fall. I’d like to invite you all to visit it: Michelle Ryan Fans. Thanks to Maria of Presenting Marion Cotillard.